I’m fairly certain that I never thought I’d write a post with this title. I never thought I would have freedom from my eating disorder. But last week marked three years of active recovery from disordered eating, and at this time three years ago, I wasn’t sure how I’d ever made it past that day or that week without caving in and answering to the voices in my head that told me I was too fat to eat dinner that night. But I did it anyway. I just went through the motions of eating until it became normal in my mind to actually eat when my body said it was time to eat. I just never thought I’d get to the point where it all became second nature again. And I definitely never thought it would be a long-term thing. I always just assumed I’d relapse and sadly eventually die from eating disorder-related caused. I kind of wanted to talk about my recovery and how my thoughts on mindful eating and emotional eating have changed a bit over the last three years since I decided to take charge of my life. Do I Have to be Mindful of Every Bite Every Day for the Rest of my Life? 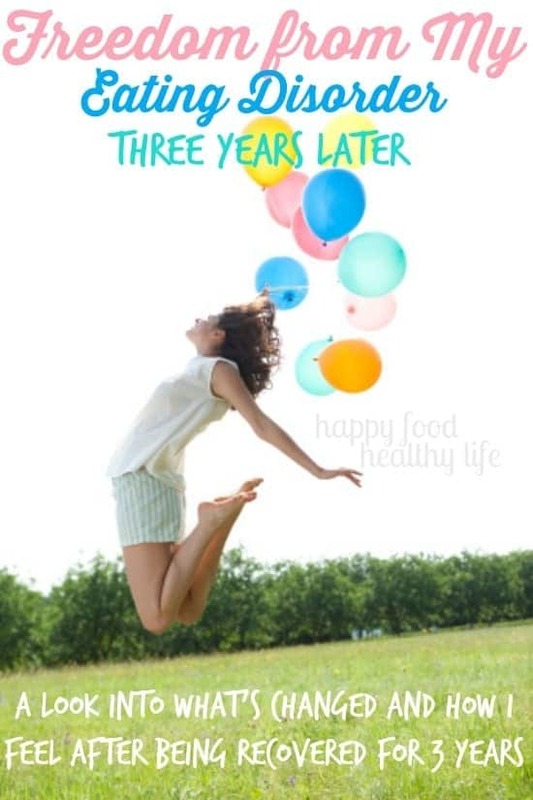 Three years ago, I had to make a conscious effort to eat mindfully. At every bite, I’d have to ask myself if I was actually physically hungry. It was almost militant. It was annoying to me, but I knew it was imperative to re-training my body and my mind to be normal. So I did it. And I preached it to others as well. Mindful eating. Being aware of what you’re eating, why you’re eating it, what your feelings are surrounding the situation, etc etc. All of those things had to be in my head at all times in order for me to stay in control. So now how do I eat? Do I ask myself the same questions at every meal? To be honest. No. I rarely even think about how I eat anymore. Every so often, when I know I’m indulging a little more than I would like, I do have to stop and ask myself if I’m still enjoying what I’m eating and if I still feel like I need to eat it. I answer honestly and act accordingly. But I will say that those occurrences are very few and far between. I just eat when I’m hungry and stop when I’m satisfied without giving it another thought. Normalcy is possible, you guys! Is it Possible to End Emotional Eating Forever? Emotional Eating happens. Especially if it is part of you and your history. If I had given into emotional eating within the first year or two of recovery, I couldn’t have handled it. I would’ve relapsed and possibly not turned back. But now, three years in, and experiencing very minimal guilt about what I eat, and I can stand to have a little larger than normal bowl of ice cream when I’m sad about something. And the different between when I emotional eat now and how I did then. I have no guilt now. I get it out of my system. I don’t eat to numb whatever I’m going through. But sometimes extra chocolate just has to happen, and in those moments, the last thing I want to ask myself is, “Are you really hungry for that piece of chocolate?” No, of course not. But does it sound good? And is it going to be comforting to me? Yes! So I eat it, and I enjoy it. And that’s that. I move on. Or maybe I eat all evening. Fine. That’s what I choose to do. The difference is that I’m not beating myself up over it. I wake up the next morning, and it’s a new day. I am very aware of the consequences of emotional eating for me. I will never have a perfectly lean and ripped body because of it, and that’s okay. There are certain size jeans I will never fit into, and that’s okay too. The point is that I do what I want to do. I know that I am safe. The voices aren’t coming back. They aren’t going to beat me up for overindulging here and there. Sometimes sadness calls for comfort food, and that’s ok. This isn’t a regularly occurring thing. It’s not something that I feel is unhealthy. It’s just giving into the comfort of food that is ingrained into so many of us. I used to hate the phrase “comfort food” because I thought that meant in order for me to indulge in these comfort foods, I would have to be eating my emotions and needing comfort from food. So that’s where I’m at now. I’ll be honest, there are times when it’s hard to be an inspiring and motivational person when sometimes I can’t even remember what it’s like to be so deep in the reigns of a mental disorder. I mean, don’t get me wrong. There’s a lot I remember about it. But it’s so not my life anymore. I don’t think about it. I’m a different person. But I still have down days. I have more of them that I’d like to admit. But the constant ugly voices in my head just aren’t there anymore. The nagging feeling that I’ll never be good enough. It’s not there anymore. The CONSTANT thoughts of food. What my next meal would be. How many hours since I had eating last. The numbers on the scale. The obsessions. The manic behaviors. They just aren’t there anymore. I guess if there’s anything that I would love for you to take away from this post, it would be this: Normal Life is POSSIBLE!! You may think you can never find your way out of whatever struggle you may be going through. Whether it’s depression, food issues, negative self-talk, etc. Whatever it is, it doesn’t have to be forever. In fact, you may even get to a point where you don’t even remember what your struggle was like completely. It’s possible. And it’s so so beautiful to be on the other side and in a position where you can help others to see the light. Thank you all for being a part of my journey. It’s not over. There is still so much more growth for me. There is still so much more I can learn and aspire to be. But I couldn’t do it without all of you. So Thank YOU!! Thank YOU for your support! It is true, I know that there are many people that can resonate with the things I have gone through, but there are only few that are willing to step up and talk about it or even comment on my posts about it!! But I will not stop talking. I will keep talking about the important things in hopes that it will inspire someone! You are awesome! Thanks for being so open and sharing 🙂 Thanks for linking up to the Be. You. Tiful Link party. oh and thank you for your kind words! I am so ridiculously open about my life, struggles and all. in hopes that maybe it will inspire and motivate others to live a full, complete, and happy life. So many things I love about this post. It can be so tedious to go through the therapy of reconnecting with your body and really tuning in to each bite. It’s like seeing a light at the end of the tunnel to hear that this eventually becomes automatic. I also love that you have learned to weather the different patterns of eating in a healthy way. Stress and other circumstances can alter your eating; but healthy people without food issues don’t give it much thought. They just go back to normal the next morning. Thanks for all of your insights and motivation. And most of all, congratulations on sticking it through when it got tough, and coming out in a better place. Thank you so much Jenny for your amazing support and understanding. I never thought I would feel normal about food, and sometimes I can’t believe that I am. Granted, there are still some times that aren’t perfect, but I’ve learned to embrace the imperfections and accept that it’s ok. This post is so beautiful and inspiring! I love how real you are. You are doing so much good and touching so many people who need to hear your words. You are awesome girl!